Trust Governor Professor Wendy Savage has won a major award for “Outstanding Contribution to Health” from the BMJ, formerly known as the British Medical Journal. Wendy, a former obstetrician and gynaecologist and a long-time supporter of C&I as a resident of Islington, was awarded the honour for her outstanding contribution to improving health and healthcare in the UK. Wendy has worked for decades championing women’s rights in fertility, abortion and childbirth and is also President of the “Keep our NHS Public”, a pressure group that opposes private contractors providing NHS care. She also served for many years on the General Medical Council and continues to be actively involved with the British Medical Association. Wendy is a Public Governor at the Trust, representing Islington, sits on the Trust’s Council of Governors’ Steering Committee, and is Chair of the Nominations and Remuneration committee. She has been a prime mover in establishing the Trust Choir comprising service users and staff and which is run in partnership with the Key Changes charity. She was presented with her BMJ award at an annual awards ceremony at the Park Plaza Hotel, Westminster. Trust Chair Leisha Fullick said: “Wendy is a tireless campaigner who has done so much for the NHS, equality of health care and for women’s health rights. Click here if you would like to learn more about the role of Trust Governors. 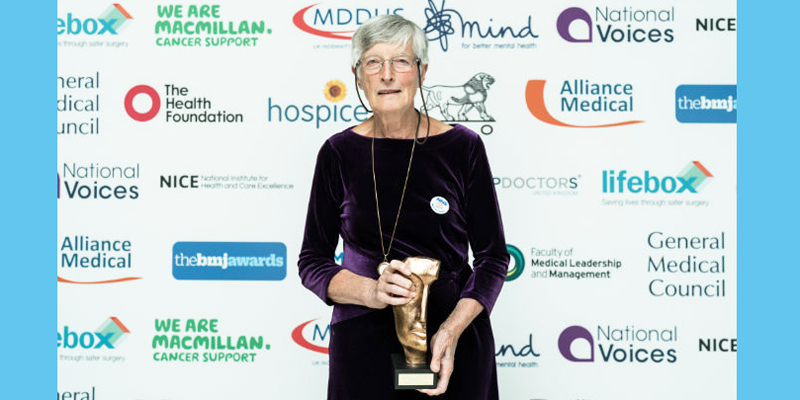 If you are a member of the British Medical Association, click here to read more about Wendy’s life and career.